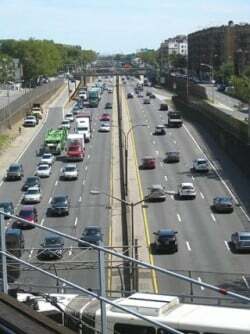 By presidential proclamation, President Barack Obama on May 9, 2014 declared the week of May 11th through May 17th as National Transportation Week 2014. With this in mind what better time is there than right now to talk transportation? For all regular Air Quality Matters blog readers paying close attention since Day-1 (Nov. 5, 2012), all should be well aware that the majority of posted articles deal with transportation with, of course, there being a connection to air. Not surprisingly, transportation contributes the most toward world air pollution and, therefore, the amount of press given here on transportation topics. One of the chief considerations when discussing transportation is the quantification of emitted pollutants; in other words, how much of what type of pollutant is being emitted one mode compared with others? For illustrative purposes, compared are airplane (A), car (C) and high-speed train (HST) for the following pollutants: Carbon dioxide (CO2), particulate matter (PM), sulphur dioxide (SO2), nitrogen oxides (NOx) and non-methane hydrocarbons (NMHC). To sum up, only for particulate matter, are airplane and high-speed train comparable. For sulphur dioxide, for “units per person travelling,” the car is the least polluting, while for carbon dioxide, nitrogen oxides and non-methane hydrocarbons, for “units per person travelling,” high-speed train is the most environmentally friendly. Among air and land transportation modes, if evaluated solely on the basis of being the least damaging to the air overall and that is used as the primary determining criteria with respect to selection, high-speed train wins hands down. But, to be fair, motor vehicle travel could be quite competitive in this regard provided there is a proliferation (read: “an uptick of almost unimaginable scale”) in non-polluting (zero-emissions) car and truck use. At the same time, this would necessitate a corresponding drop in combustion vehicle operation of unprecedented proportions. Though not impossible, at this time something on this order is not likely. Nonetheless, the prospect is an interesting one to consider, especially considering National Transportation Week being this week. High Speed Rail and Sustainability, “Air pollution,” Union of International Railways (UIC), Nov. 2011, p. 21. Ibid, “Figure 11 A modal comparison of air pollutant emissions,” p. 22.